U.S. consumer prices, which have been buffeted this year by soaring energy costs, fell by 0.1 percent in July as gasoline costs posted their biggest decline in eight months, the government reported Tuesday. The easing of gas prices was good news, since high fuel costs hurt a wide range of businesses and households, discouraging firms from hiring employees and consumers from spending. But the absence of any inflation could be an indication of continued sluggishness in the economy, since firms usually need some room to raise prices before they can hire or invest. The drop in inflation could also complicate matters for the Federal Reserve, which has been raising interest rates — an atypical move this close to a presidential election — to head off inflation that has yet to appear. The Fed last week boosted a key short-term interest rate for a second time this year but continued to signal that future rate increases should take place at a gradual pace unless inflation threatens to become more of a problem. The Labor Department said the decline in its closely watched Consumer Price Index was the first decrease since a 0.2 percent drop last November, a decline which also reflected a decline in energy costs. The CPI had been up 0.3 percent in June and an even sharper 0.6 percent in May, reflecting big jumps in energy costs. Excluding energy and food, consumer prices rose a tiny 0.1 percent in July, matching the June increase. Through the first seven months of this year, consumer prices have been rising at an annual rate of 4.1 percent, sharply higher than the 1.9 percent increase for all of 2003. However, this acceleration reflects a big jump in energy prices. So far there have been few indications that price pressures in this area are threatening to turn into a general inflation problem. The core rate of inflation, which excludes volatile energy and food prices, has been rising at a more moderate annual rate of 2.4 percent, up from a tiny 1.1 percent increase in 2003. The 0.1 percent decline in consumer prices last month reflected a 1.9 percent drop in energy prices, which had posted sharp increases of 2.6 percent in June and 4.6 percent in May. Analysts said that energy represents the biggest wild card that could endanger the current recovery. Crude oil pushed through the $45 per barrel level for the first time last week, hitting a record $46.58 in trading on Friday, reflecting worries about increased violence in Iraq and other threats to supplies. However, prices retreated a bit on Monday, dropping to $46.05 per barrel after President Hugo Chavez of Venezuela, a major world oil supplier, survived a recall election. 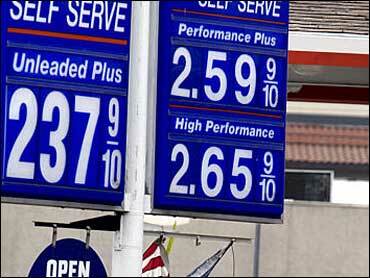 Gasoline prices actually fell by 4.2 percent in July, the biggest decline since a 5.1 percent drop in November. However, energy costs are likely to continue to be buffeted by uncertain geopolitical events. The Lundberg Survey showed that prices last Friday had dropped by nearly 5 cents in the past three weeks with the nationwide average falling to $1.90 per gallon, down significantly from the peak at slightly more than $2.10 per gallon in mid-May. But analysts cautioned that gasoline prices could head higher in coming weeks depending on whether there are further global supply disruptions or increased worries about events in Iraq. Food prices in July edged up a modest 0.2 percent, matching the June advance, with both months far below a sharp 0.9 percent gain in May. Last month, the price of dairy products, fresh fruits and fresh vegetables were all down. The small 0.1 percent rise in inflation pressures outside of food and energy reflected a big 0.8 percent decline in clothing costs, the biggest drop in more than three years. That helped to offset a 0.3 percent rise in medical costs and a 0.2 percent increase in housing costs. In other economic news, the Commerce Department reported Tuesday that construction of new homes and apartments rose by 8.3 percent in July. The bigger-than-expected gain pushed housing construction to an annual rate of 1.978 million units last month, making up the lost ground from a 7.7 percent decline in housing starts in June. Even though the Fed has begun raising interest rates, mortgage rates have remained at still attractively low levels. Meanwhile, the National Association for Business Economics said Tuesday that terrorism has replaced weak employment growth and the ballooning budget deficit as the biggest immediate threat to the economy. The NABE said that terrorism and defense issues were picked by 40 percent of its survey panel as the biggest short-term threat facing the economy, well ahead of government spending and the deficit which was selected by 23 percent of the 117 NABE members surveyed. "Terrorism produces the greatest short-term risk to the economy, and that's where NABE's members believe the next president should spend most of his effort," said Duncan Meldrum, president of NABE and chief economist for Air Products and Chemicals Inc. In response to a separate question on the top priorities for the next administration, the NABE survey respondents said the next president should devote 25 percent of his time to the Middle East and terrorism. In second place, the survey group recommended 17 percent of the next president's time and energy be devoted to the budget deficit, which is projected to hit a record $445 billion this year. The deficit needs to be brought under control primarily by cutting government spending, in the view of 51 percent of the NABE group while 32 percent said tax increases should be emphasized. On the spending side, cutting farm subsidies was favored by 50 percent of the panel while 21 percent recommended reductions in overall government spending and 11 percent said efforts were needed to trim government health care costs.